Alice: I'm afraid I can't explain myself, because I'm not myself you know. White Rabbit: ... And the King. Alice's Sister: Alice. Will you kindly pay attention to your history lesson? Alice: I'm sorry, but how can one possibly pay attention to a book with no pictures in it? Alice's Sister: My dear child, there are a great many good books in this world without pictures. Alice: In this world, perhaps, but in my world, the books would be nothing but pictures. Alice's Sister: Your world? Huh! What nonsense. Alice's Sister: Once more, from the beginning. Alice: [to her cat] That's it, Dinah. If I had a world of my own, everything would be nonsense. Nothing would be what it is, because everything would be what it isn't. And contrariwise, what it is, it wouldn't be. And what it wouldn't be it would. You see? Alice: In my world, you wouldn't say "meow." You'd say, "Yes, Miss Alice." Alice: Oh, but you would. You'd be just like people, Dinah. And all the other animals too. Mad Hatter: A very merry Un-Birthday to you! White Rabbit: ...thereby causing the Queen to lose her temper. Alice: Now where do you suppose...? Alice: [turns around to find just the Cat's smile talking to her] Oh my! oh, no no, I was just... uh never mind. Cheshire Cat: You know? We could make her really angry! Shall we try? Alice: When I get home I shall write a book about this place... If I ever do get home. Alice: [as a giant] And as for you... Your Majesty! Your Majesty indeed! Why, you're not a queen, [shrinking] But just a - a fat, pompous, bad tempered old ty...! [normal size] Tyrant. Alice: But that just isn't the way. Caterpillar: [suddenly angry] I am "exaketededly" three inches high, and it is a very good height, in-deed! Alice: But I'm not used to it. And you needn't... shout! Alice: Well, I am... I mean, I was. Alice: [after eating a mushroom] I'm tired of being only three inches high. [suddenly grows out of control] Yi-yi-yi-yi-yi-yi-yi-yi-yi-yi! Queen of Hearts: So where were you going, my child? Queen of Hearts: YOUR WAY? ALWAYS GO MY WAY! Card Painter: Oh no, Your Majesty, please! It's all his fault! Alice: Oh, Dinah. It's just a rabbit with a waistcoat-- and a watch! Rabbit: Oh, my fur and whiskers! I'm late, I'm late, I'm late! Alice: Now this is curious. What could a rabbit possibly be late for? [running after him] Please, sir! Rabbit: I'm late, I'm late. For a very important date. No time to say hello. Goodbye. I'm late, I'm late, I'm late. Alice: Oh, Cheshire Cat! It's you! Cheshire Cat: Whom did you expect? The White Rabbit perchance? Alice: [crying] Oh, no, no, no. I-I-I'm through with white rabbits. I want to go home! [blows nose] But I can't find my way. Cheshire Cat: Naturally. That's because you have no way. All ways here, you see, are the QUEEN'S WAYS!! Cheshire Cat: You haven't? You haven't?! Oh, but you must! She'll be mad about you. Simply mad. Alice: I'll find something useful to do with my life. Alice: Ohhh...... [gets tickled by the Pink Flamingo and starts laughing and then pounds the flamingo repeatedly on the ground] Stop! Alice: Do you want us BOTH to lose our heads?! Pink Flamingo: Uh-huh. Queen of Hearts: Off with his head! King of Hearts: Off with his head. Off with his head. By order of the Queen. Uh, you heard what she said. Alice's sister: Alice... Alice... will you kindly pay attention and recite your lesson? Alice's sister: Alice, what are you talking about? Alice's sister: Caterpillar? Oh, for goodness sakes. Alice, I... Oh, well. Come along, it's time for tea. Doorknob: [tries to open the door] D'oh! I'm - still locked, you know! Alice: [in horror] But the queen! I simply must get out! Doorknob: [chuckles] But you are outside. Alice: Why - why that's me! I'm asleep! Alice: [in terror, through the Doorknob's mouth] Alice, wake up! Please, wake up, Alice! Alice's sister: [changes to her sister's] Alice! Alice! Will you kindly pay attention and recite your lesson? Caterpillar: ...and the other side will make you grow shorter. March Hare: Start at the beginning. Mad Hatter: Yes, yes. And when you come to the end...[chuckles] STOP. See? Tweedle Dee, Tweedle Dum: [singing together] How do ya do and shake hands, shake hands, shake hands. How do ya do and shake hands and state your name and business. [both spoken] That's manners! Alice: [drinks from bottle] Mmm... tastes like cherry tart. [shrinks down] Custard. [shrinks down] Pineapple. [shrinks down] Roast turkey. [now at minimum size] Goodness! What did I do? Mad Hatter: [after "fixing" the White Rabbit's watch] Two days slow, that's what it is. White Rabbit: We need a lazard with a liddle... a lad... can you help us? Bill: Righto, gov'nor... Monster? Aaaaah! March Hare: I have an excellent idea, let's change the subject. 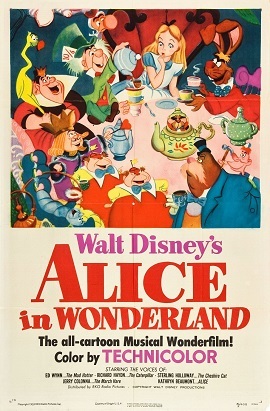 Alice: Well, when one's lost, I suppose it's good advice to stay where you are until someone finds you. But who'd ever think to look for me here? [sigh] Good advice. If I listened earlier, I wouldn't be here. But that's just the trouble with me. I give myself very good advice, but I very seldom follow it. March Hare: It's very simple. Now, thirty days has Septem -No. wait... An unbirthday, if you have a birthday, then you - [laughs] She doesn't know what an unbirthday is. White Rabbit: Don't just do something, stand there... Uh... no no! Go go! Go get my gloves! I'm late! Alice: You can learn a lot of things from the flowers... Huh! Seems to me they could learn a few things about manners! Alice: Riddles? Now let me see... why is a raven like a writing desk? Queen of Hearts: I warn you dear child, if I lose my temper, you lose your head. Understand? Alice: Better read it first, for if one drinks much from a bottle marked "Poison", it's almost certain to disagree with one sooner or later. The Rose: [as Alice slaps the Daisy's leaves away] Rather scrawny, I'd say.